In recognition of over a decade of Rotary Club of Agincourt supporting CTV Christmas Toy Mountain Campaign. 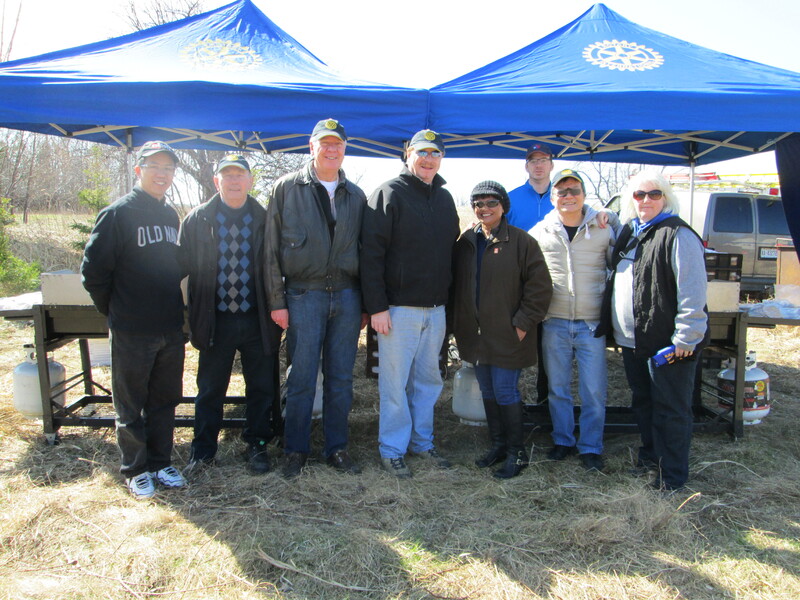 The Rotary Club of Agincourt participated in the tree planting event in Markham today. We supplied and cooked burgers for all the people who planted trees. in Ontario, where they planted 6,000 -8,000 seedlings. In this month’s issue of The Rotarian, “The Vindication of Vaccination” takes a step in that direction. I invite everyone to read it, absorb it, and retain it, and share it with your family members. The opposition to vaccination is based on fear of the unknown. So let’s be knowledgeable. Thank you very much for the invitation to the Rotary Club of Agincourt concert. It was a complete success in my mind. Not only the entertainment and the program were spectacular you managed to bring Rotary to the forefront. And you really surprised me with your talent! Wow! My hats off to everyone involved with this project. A job well done. Just a quick note to thank you again for a lovely evening last night. Jo-Ann and I thoroughly enjoyed ourselves and the music selection and performances were outstanding. Santha has a fabulous voice and is such an accomplished, trained professional. Congratulations again for organizing and hosting this successful fundraising event. Congrats on a fantastic evening!!! Great reviews for the entertainment! Santha – your voice is beautiful and you are a great entertainer. Ivan – you are a great entertainer too and we all enjoyed your fun stuff!! All the other singers were really good too, so the evening was very easy to enjoy. I heard nothing but good comments from everyone around us. Just wanted to tell you how much I enjoyed the evening!!! We would like to thank you for giving us the opportunity to attend last night’s charity concert you and your team put together for Agincourt Rotary Club. It requires a lot of planning, work, time/effort for this full 2-hour entertainment. What a great concert that me and William thoroughly enjoyed. I specially enjoyed Santha’s excellent performance. She has got a voice without border. She can sing practically any music with such a natural passion and put the listeners into the right mood whether it is theater music or blues. What surprises us the most is that she is a professional accountant, lecturer, MC…..How can one person have so many talents and raising two children at the same time. One of the highlights of last night of course is the piece you sang – “What a Wonderful World” originally sang by Louis Armstrong and Country Road by John Denver. What a great job you did. I clapped my hands so hard until they hurt. DB Brian informed us that joining Rotary in 1980 was one of the best things that ever happened to him – he recounted his first Rotary moment when in 1983 he attended a conference where he and his wife Karen spoke with an inspirational couple, Clem and June – he later learned that Clem was a past RI President. DG Brian was impressed with the quality of people in Rotary and became President of this club a few years later. DG Brian asked us to Light our own candle and presented the club with the 2014-2015 banner Light Up Rotary. By the way, you should learn how to read in Chinese this time.